Karkala, Sep 04, 2017: The marriage ceremony of Sudhakar and Hareenakshi, was celebrated with plastic use being completely banned in the affair. At least 700 people gathered to bless the couple at the Srimathi Thumbe Karkera Sabhabhavan in Ucchila. The organisers were instructed to take care of disposal of waste once the ceremony was held. Steel and china glass products were used to serve the guests. Fresh flowers and leaves were used to decorate the auditorium. 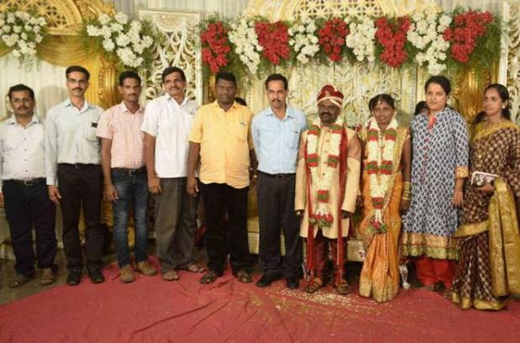 Zilla Panchayat president Dinaker Babu guided the organisers, while the couple had a surprise visitor - Udupi DC Priyanka Mary Francis, who arrived and wished the couple for adopting an innovative method to celebrate their special day. Two PDOs of nearby gram panchayats arrived to look into the arrangements and had reported to the DC immediately. The DC said,couple who adopt environmental-friendly methods would receive a certificate from the district administration. Besides, the people who are part of the function like caterers and decorators would also be given certificates. The district has taken up an intensive campaign against the use of plastic and educating people at all levels. Udupi district should be declared garbage-free on October 2, 2018. DC also praised the caterer Deekshith Shetty and advised him to continue his novel work. Various youth associations in the district are being trained over the resourceful solid waste management programmes.